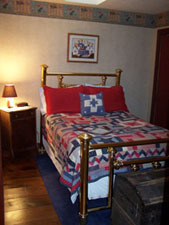 From the brass quilt covered bed to the red, white, and blue color scheme, The Americana Suite is a step back in history with its unique display of patriotic folk art. 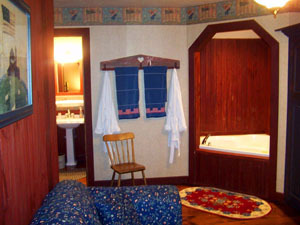 You can enjoy a late breakfast by the fireplace or relax with a book in the built-in whirlpool tub. 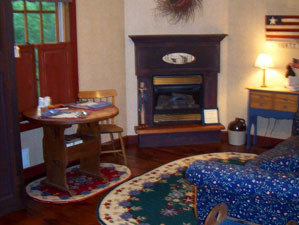 The Americana Suite includes a parlor, bedroom, fireplace, private bath, entertainment center, and enough creative art to brighten the day of every guest. The Americana Suite is available for $105 per night. Click Here to request a reservation online.